- Players’ security, playing area and seating arrangements have been finalised. No outsider will have access to World Chess Champion Viswanathan Anand and World Chess Challenger Magnus Carlsen before the championship. The players will, however, attend the post-game press conference every day. - Both chess teams are expected to check in at the Hyatt Regency by November 2-4 and would be allocated separate floors. Separate elevators will take Anand and Carlsen straight to the playing arena. All entry and exit points will be barricaded. - Playing arena will be accessible only to the players, chief arbiter, deputy arbiter and a hotel staff member for serving refreshments to the players. - Media, public, fans won't have access to either Anand or Carlsen before the World Championship Match begins. - A sound proof glass partition will separate the players from the audience as has become an international tradition for international chess events. This, after all, is the World Chess Championship! - Electronic gadgets, mobile phones, tablets, etc would not be allowed into the venue. - Two large audio-visual screens will be installed in the spectators' area. - A small area behind the spectators’ area will be available to 100 registered chess players at a time for watching the game of the day. This area will not have any seating arrangement. - Journalists would have to follow the match live in the media centre where post-game press conferences will also be held. Leading Indian chess videographer Vijay Kumar is known for his videos of world chess events, particularly every single one featuring World Chess Champion Viswanathan Anand. Here is his video of World No. 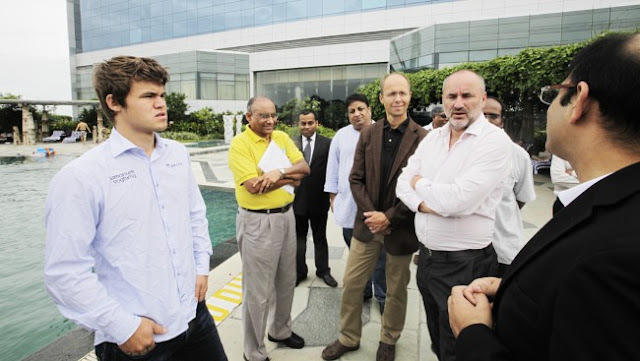 1 Magnus Carlsen and his team's visit to inspect the venue of the upcoming World Title match in Chennai, India from November 6-26. They say you cannot go back from India without a lasting impression and without being treated as an honoured guest. 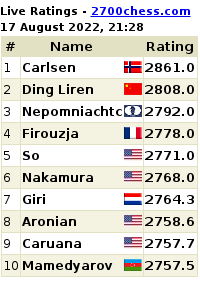 Is India going to be lucky for Carlsen? The welcome was traditional, the arrangements up to the mark and the excitement... well, watch it for yourself! And, do keep track of all the expressions on the chess prodigy's face. Here are the first photos from World No. 1 Carlsen's Facebook page where he has posted the first photos after reaching Chennai, India on August 18. 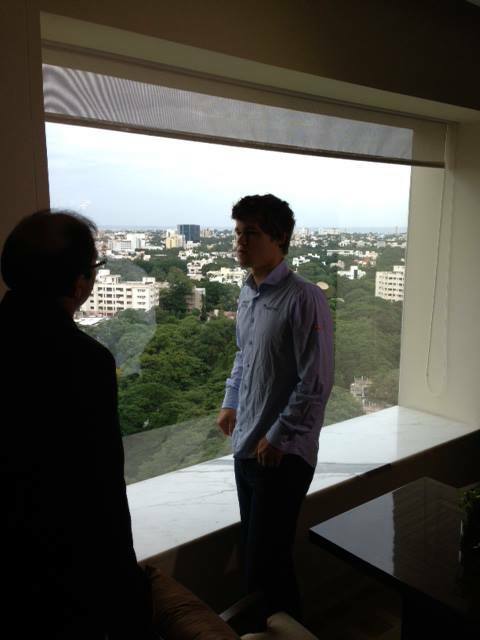 Grandmaster Magnus Carlsen is visiting Chennai to inspect the venue of the World Chess Championship 2013 to be held from November 6-26. He will also hold a simul in Chennai to help promote chess for children between 7 to 17 years of age. His opponents will be 20 children from the South Indian State of Tamil Nadu (of which Chennai is the capital city) who have won medals in International chess competitions. Carlsen, in his FB post, along with the photos writes: Just arrived Chennai and got a very friendly and hospitable welcome! — in Chennai, Tamil Nadu. Met by friendly people at the hotel! Photo captions are World No. 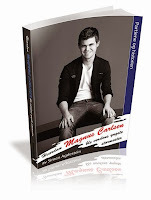 1 Magnus Carlsen's comments. Carlsen’s is accompanied by his father Henrik Carlsen and his manager Espen Agdestein. World Champion Viswanathan Anand's wife and manager Aruna has already inspected the World Championship venue. 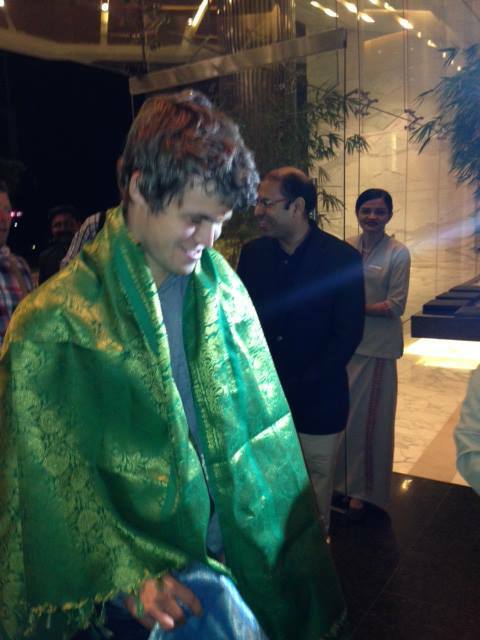 Magnus Carlsen was received by FIDE vice-president from India DV Sundar, All-India Chess Federation (AICF) honorary secretary V.Hariharan, AICF CEO Bharat Singh Chauhan and Tamil Nadu State Chess Federation vice-president B.Muragavel. 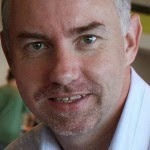 Carlsen is expected to fly out late August 20. 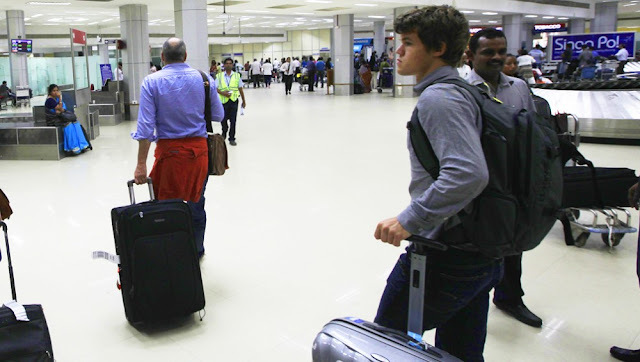 CHENNAI (NRK.no), Magnus Carlsen (23) was flown into the World Cup city of Chennai in the middle of the night in fear that chess fans would create chaos at the airport in India. We were told that the landing time was strictly secret, says manager Espen Agdestein to NRK. 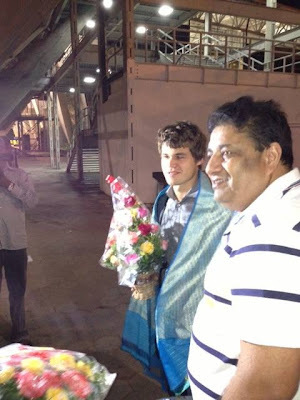 Carlsen reached Chennai Sunday at 03:30 local time with his manager, chef and father. The timing was anything but ideal, but the International Chess Federation, FIDE, thought it was absolutely necessary. 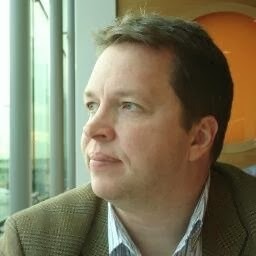 "They were afraid that it would be difficult to get from the airport to the hotel if this information came out," says manager Espen Agdestein to NRK. World Chess Championship 2013 Venue: What FIDE, Carlsen, AICF, Anand and Everyone Said! The World Chess Championship 2013 venue was decided after quite a few twists and turns. There was quite a bit of uncertainty over Chennai as the venue for the eagerly-awaited World Chess Championship match between Viswanathan Anand and Magnus Carlsen after the World No 1 player from Norway expressed unhappiness with the FIDE's choice of venue. FIDE signed a Memorandum of Understanding (MoU) with All India Chess Federation and Tamil Nadu State Association for holding the World Championship match in Chennai, the home city of World Champion Viswanathan Anand stating that India had been offered to host the event last year itself when Russia had outbid India for hosting the Anand - Boris Gelfand World Chess Championship 2012 in Moscow. It was feared that Carlsen's might refuse to sign the contract. According to Carlsen's agent, Espen Agdestein, they were not happy that the MoU was signed without following a bidding process as described in the FIDE regulations for the World Championship match. Agdestein said there should be an open bidding process and a neutral venue for the match and that the world body should have a dialogue with both players before arriving at a final decision. There were rumours about a preferred World Chess Championship 2013 venue being New York, Miami, St Tropez, Paris and Tromso. The Norwegian town is already hosting the 2013 World Chess Cup and the 2014 World Team Olympiad. Later, Norwegian Chess Federation president Jøran Aulin-Jansson even sent an open letter as a "formal complaint" to FIDE on the selection of Chennai as the venue for the 2013 World Chess Championship match. The letter called for a "fair and transparent procedure and competition for the selection of the organiser" while emphasising that the letter was not a campaign against the organisers in Chennai. Soon thereafter, the French Chess Federation approached FIDE to have Paris as the World Chess Championship 2013 venue. "FFE, in collaboration with the City of Paris, on behalf of a group of private companies, is a candidate for organising the World Chess Championship 2013. The presidential office of FIDE, which will meet this weekend, should address the problem of opening a tender for this match. 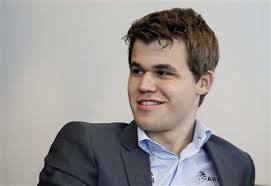 In fact, after the Match was given to Chennai (India), Carlsen and the Norwegian Chess Federation have officially requested that the game takes place in a neutral country," stated a press release supported by Mayor of Paris Bertrand Delanoe and French chess federation president Philippe Mouttou. 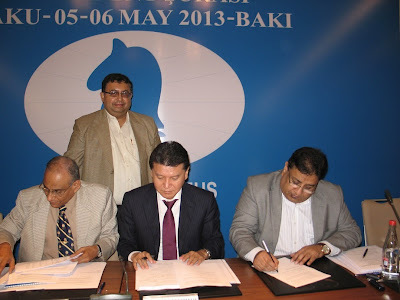 Finally, FIDE went ahead and signed a contract with the All India Chess Federation (AICF) to have Chennai as the venue of the World Chess Championship 2013 match. 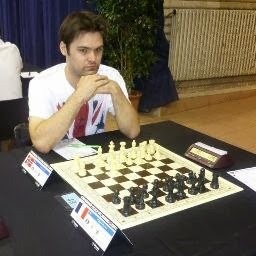 In a press release dated ay 6, 2013, FIDE defended the choice of Chennai as venue stating, "Since the Candidates’ Tournament ended, and GM M. Carlsen became the challenger of the coming World Championship Match there have been several developments, mails exchange between all parties (Carlsen, Anand, FIDE), questions asked, and also speculations. "FIDE would hereby like to put forward the current situation regarding this event. "Consequently three of the last matches were given to an organizer without a bidding procedure. "On March 15th India asked to extend the option until April 10th and FIDE agreed to it because it was clear that the bid would be accepted and just needed an approval of the Tamil Nadu State Parliament, a session which took place on April 8th. One could ask why was the extension given to a date when the name of the challenger will be known already, and the simple answer is that FIDE, being convinced that the positive answer was just a matter of technicality, did not want to lose this bid for an alternative that gave no guarantee for a better result or any result at all. "When the approval of the bid by India was published and FIDE representative was called to formalize it, on April 8th, GM Carlsen’s manager contacted FIDE and asked to have a meeting to discuss this matter before a formal move is done with India. "Carlsen and FIDE’s representatives met in FIDE office on April 15th, when all claims were brought up by Carlsen’s representatives and were answered by FIDE. Among the points raised and answered we would like to emphasize one and this is the issue which was also raised in media – the question of neutrality. Unfortunately it has always proved difficult to find a sponsor to such a match when the name of the challenger is not known yet. Therefore most of matches in the past were organized in one of the participant’s countries. Consequently both World Champions Anand and Topalov played in their opponent’s country – a natural result of the situation. "On that day both parties signed a paper whereby it was agreed to give Norway an option to come up with an organizer for half of the match, provided that India would accept such a solution. "FIDE tried its hardest to convince India to split the match, but they refused India wanted to fulfill what has been approved by the government of the Tamil Nadu State and FIDE had to keep its obligations, and consequently an MoU was signed in Chennai on April 19th. One day later, the FIDE President visited France, where he got a proposal to organize the match in Paris. Mr Ilyumzhinov promised to bring the proposal before the Presidential Board. The French proposal was higher than the Chennai one, with more contributions offered. However, the Board decided (unanimously with one abstention) that FIDE must respect its obligation and thanked the French federation and the city of Paris for their proposal, hoping that there will be another opportunity to have a big event in Paris. "FIDE has acted with full transparency during the whole process, trying its best to secure the match and standing by its obligations and reputation. FIDE will do everything to secure equal conditions for both players and also will try and still trying to increase the prize fund for the match. FIDE wishes these two great players a successful match, and is sure that India, the homeland of Chess will bring to the world a fascinating event. Gens Una Sumus." 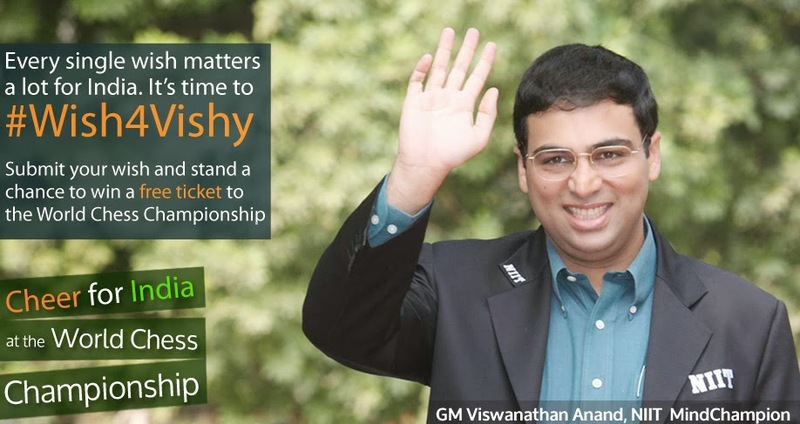 "After qualifying for the World Championship match by winning the London Candidates I have been highly motivated for, and looking forward to the World Championship match against reigning champion V. Anand. "I’m deeply disappointed and surprised by the FIDE decision to sign a contract for the 2013 match without going through the bidding process outlined in the WC regulations, and for not choosing neutral ground. The bid from Paris clearly showed that it would be possible to have more options to choose from.The lack of transparency, predictability and fairness is unfortunate for chess as a sport and for chess players. "My team and I will now start preparing for the match. The main thing now will be to come to an agreement with the Indian Chess Federation and FIDE regarding terms and conditions before and during the match. I really hope this process will run quick and smoothly. 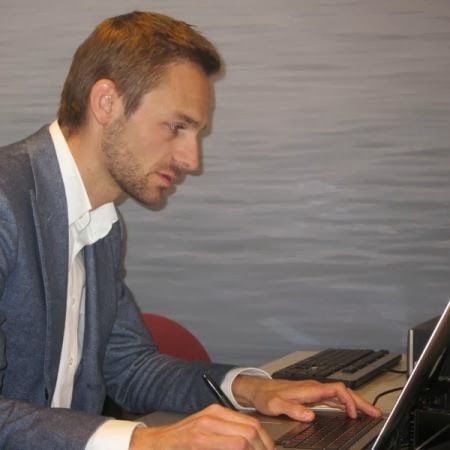 "Lastly, I will not let the news from Baku diminish the joy and excitement derived from playing the top level Norway Chess tournament starting tomorrow."